Saturday morning was a perfect time to stay in a nice warm bed, drink some hot coffee and peruse the Times with a blanket and multiple layers of warm clothing. Because it was 14 degrees out with a windchill of 6. I tried not to think of this as I prepared to run the NYRR Manhattan Half Marathon in Central Park. 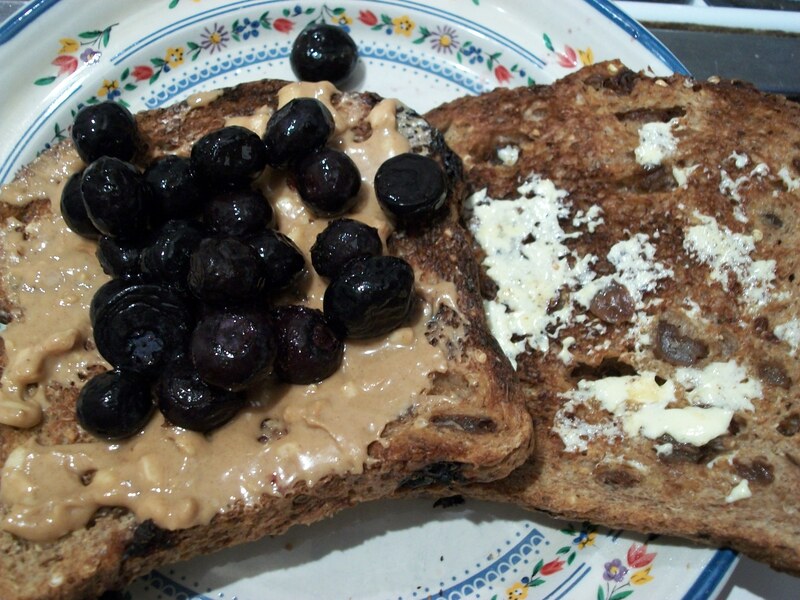 I fueled up with two pieces of Ezekiel sprouted grain cinnamon raisin toast with peanut butter, blueberries and Smart Balance. Layers are tricky when the weather is that cold, but I decided on wearing two pairs of tights, two long sleeved shirts and a light jacket and two pairs of gloves (no photo – I was in a bit of a rush!). 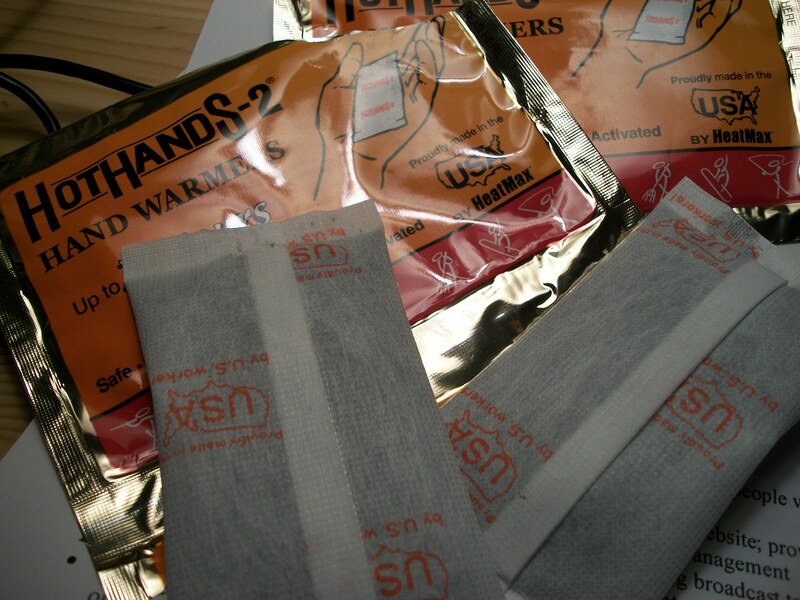 I carried these babies in my hands for the whole race and was toasty and warm. Maybe the layers of tights were a bit much – they made the legs feel a bit heavy and kind of weird. NYRR says my official time was 1:49:50, about 8:23/mile. I finally achieved my goal of breaking 1:50:00, and feel pretty good that it was on such a tough course in such hellish weather, and I really felt like the pace was fairly easy. I want to run a half in better conditions/course to see what happens! I cooled down by running home, which was another 1.25 miles, bringing my total for the day to about 16.5 miles. Another thing that got me through this race was a brunch date with Lindsey, who was also crazy enough to run the race. I can’t think of anything I’d rather look forward to after a long, cold run than warm crepes filled with delicious goodness. 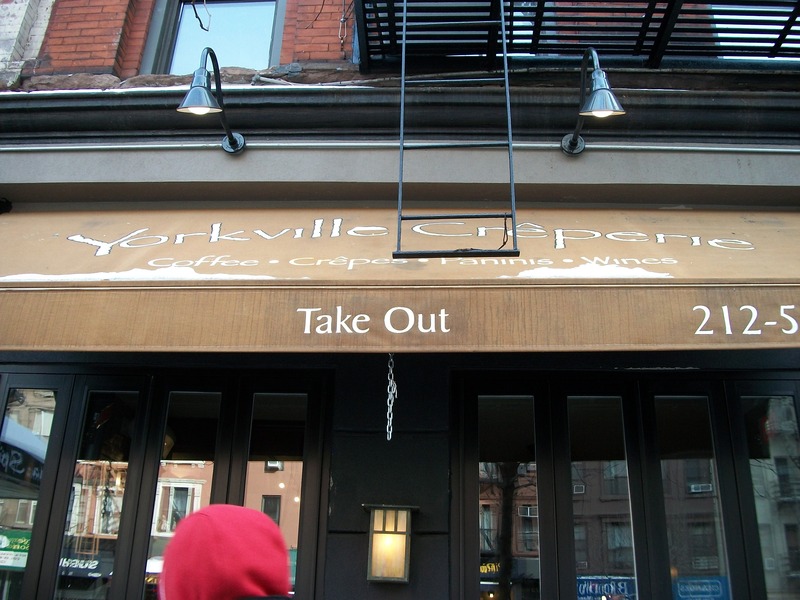 So after we showered we met up at this great joint, right in the ‘hood. I’m super indecisive, so having to decide between a sweet or savory crepe, and then between all of the delicious choices was tough. 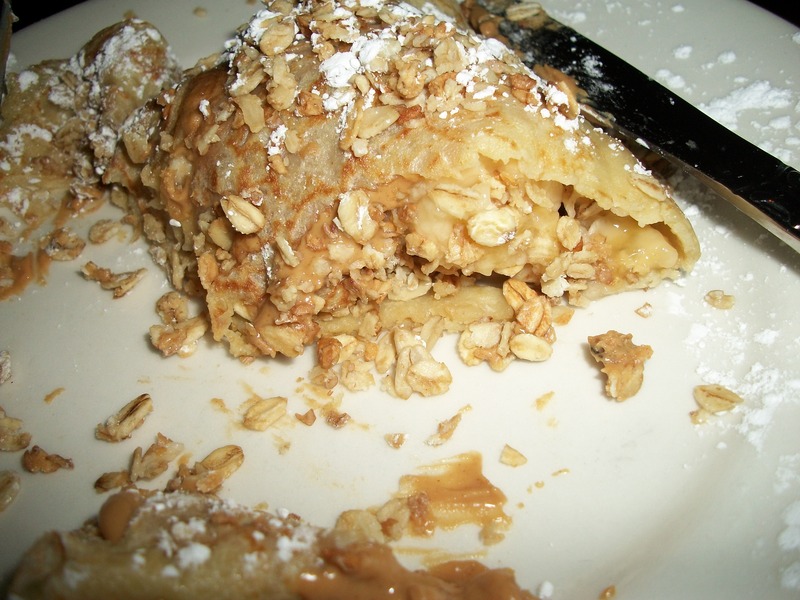 I decided on the “Protein” crepe – peanut butter, banana and granola. Lindsey had the “Country” crepe with strawberries, banana and nutella, which also looked amazing. Question: What’s your favorite way to start a weekend? 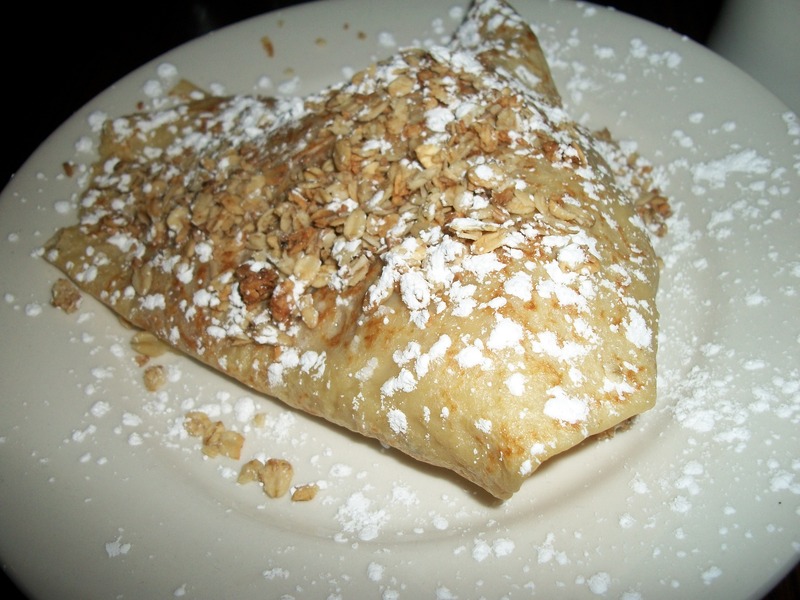 Have you ever had a crepe (and if so, sweet or savory?)? awesome job! im seriously so impressed. i hope to run one this fall EEK!!! I’m at the gym stretching reading this! Amazing job on a hilly course. That’s my dream to break 150 but honestly if I come close to my pr I’ll be happy! You should run the national half! Its flat! Those crepes look delicious! thanks Lizzy! hmm national half…thinking about it..
Kelly- Congrats on the run! I use those hand warmers things a lot for snowboarding but for my feet. I have never had crepes! They sound so good though. YAY!! Breaking 1:50! Awesome job!! Loved reading the report and the mantra of let the hills determine the pace. I WANT THAT PROTEIN CREPE NOW! Excellent choice! congrats on a job well done! awesome work breaking 1:50 too! I had hand warmers and foot warmers in place while I cheered you folks on. My favorite way to start a weekend is a Sprint Tri. thanks! Even though it was totally nuts to go out there and cheer, that was awesome of you! Woohoo! Congrats on your PR! I’m so surprised we didn’t see each other running because our times were so close. Although in my scary mask, you would not have recognized me. I am definitely down for crepes again next weekend after our 14-miler! 🙂 The thought of crepes certainly helped get me through that race. damn impressive! kudos to you for sticking out through the freeeeezing cold AND PR-ing! amazing. after 1/2 marathons, and even 10Ks, I don’t even have the energy for brunch out. but i guess the allure of the crepe wins. looks yum! Also – your description of laying in bed on a cold morning reading the paper pretty much sounds perfect to me. I usually am too anxious to get my day started to actually do that on the weekends, but when I do, it’s wonderful. Your protein crepe looks like a pretty incredible post-race meal! I had a nutella banana crepe in Paris – that was probably my all time favorite. I’m the same way – too anxious to get my day started to sleep in EVER. It’s a curse, I tell you! congrats on breaking 1:50! you must feel great about it! normally i’d say a run is a great way to start the weekend but lately i’ve been enjoying the whole “sleeping in and lounging a bit” thing. Congrats thats awesome!! Your crepes look delicious! Great job!!!!!!!!! I’ve never had a crepe, I need to fix that. Congratulations, Kelly! You rocked that half! Seriously impressive given the temperature, and using handwarmers was a genius idea. I’ll have to try that! We have a really cute creperie near our house that has both sweet and savory varieties. 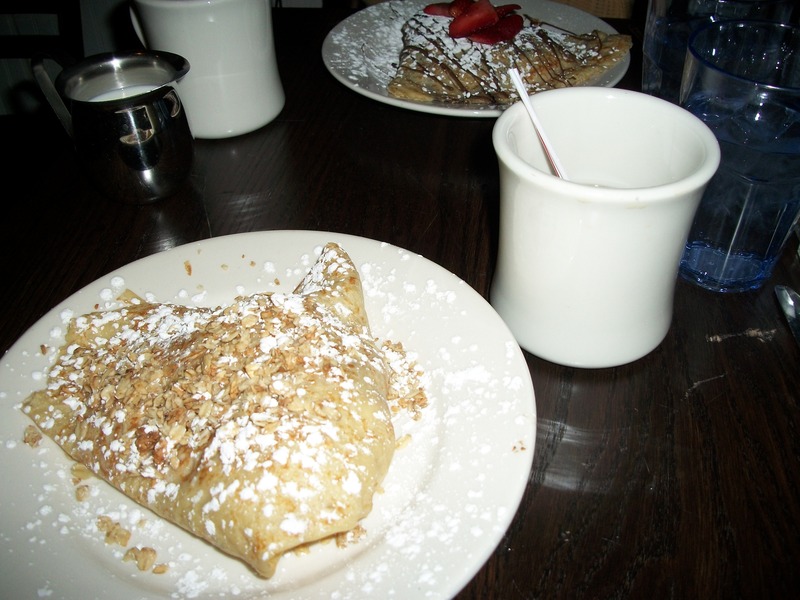 Crepes-love ’em but rarely have them….I need to change that! Congrats that is so fun!! I haven’t run one in a few years but would really like to get back to hitting the pavement! You are a brave soul though, I don’t know if I could run one when it is that cold!! eek! Amazing job! I am always amazed when people keep an incredible time despite snowmagedon temps! It was so cold that day that I am surprised the sweat didn’t freeze on your face! If your looking for some more halfs look into the Rutgers Unite Half in Mid April. Just hop on the NJ Transit and you are there. 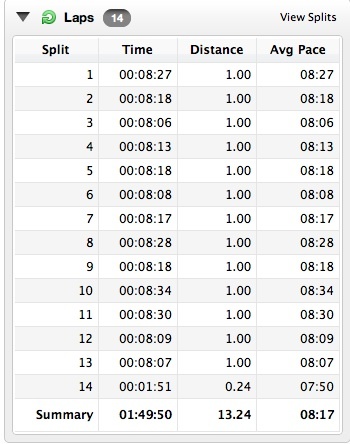 I am also looking at the Long Island Half too(May 1st). I love crepes! Sweet more than savory. I love Nutella in mine. There is a place in Vegas at Cesears Palace called Payard that makes the best sweet and savory crepes! Oh and the place in Paris (Las Vegas) has great crepes too!